When you enable load balancing, your AWS Elastic Beanstalk environment is equipped with an Elastic Load Balancing load balancer to distribute traffic among the instances in your environment. Elastic Load Balancing supports several load balancer types. To learn about them, see the Elastic Load Balancing User Guide. This topic describes the configuration of a Network Load Balancer. For information about configuring all the load balancer types that Elastic Beanstalk supports, see Load Balancer for Your AWS Elastic Beanstalk Environment. You can choose the type of load balancer that your environment uses only during environment creation. You can change settings to manage the behavior of your running environment's load balancer, but you can't change its type. With a Network Load Balancer, the default listener accepts TCP requests on port 80 and distributes them to the instances in your environment. You can configure health check behavior, configure the listener port, or add a listener on another port. Unlike a Classic Load Balancer or an Application Load Balancer, a Network Load Balancer can't have application layer (layer 7) HTTP or HTTPS listeners. It only supports transport layer (layer 4) TCP listeners. HTTP and HTTPS traffic can be routed to your environment over TCP. To establish secure HTTPS connections between web clients and your environment, install a self-signed certificate on the environment's instances, and configure the instances to listen on the appropriate port (typically 443) and terminate HTTPS connections. The configuration varies per platform. See Configuring Your Application to Terminate HTTPS Connections at the Instance for instructions. Then configure your Network Load Balancer to add a listener that maps to a process listening on the appropriate port. A Network Load Balancer supports active health checks. These checks are based on messages to the root (/) path. In addition, a Network Load Balancer supports passive health checks. It automatically detects faulty backend instances and routes traffic only to healthy instances. You can use the Elastic Beanstalk console to configure a Network Load Balancer's listeners and processes during environment creation, or later when your environment is running. Use the Create New Environment wizard to start creating your environment. On the wizard's main page, before choosing Create environment, choose Configure more options. Choose the High availability configuration preset. Alternatively, on the Capacity configuration card, configure a Load balanced environment type. For details, see Capacity. On the Load balancer configuration card, choose Modify. Select the Network Load Balancer option, if it isn't already selected. Make any Network Load Balancer configuration changes that your environment requires. Choose Save, and then make any other configuration changes that your environment requires. If the Load balancer configuration card doesn't have a Modify button, your environment doesn't have a load balancer. To learn how to set one up, see Changing Environment Type. Make the Network Load Balancer configuration changes that your environment requires. Use this list to specify listeners for your load balancer. Each listener routes incoming client traffic on a specified port to a process on your instances. Initially, the list shows the default listener, which routes incoming traffic on port 80 to a process named default, which listens to port 80. Select the check box next to its table entry, and then choose Actions, Edit. Use the Network Load Balancer listener dialog box to edit settings, and then choose Save. In the Network Load Balancer listener dialog box, configure the required settings, and then choose Add. 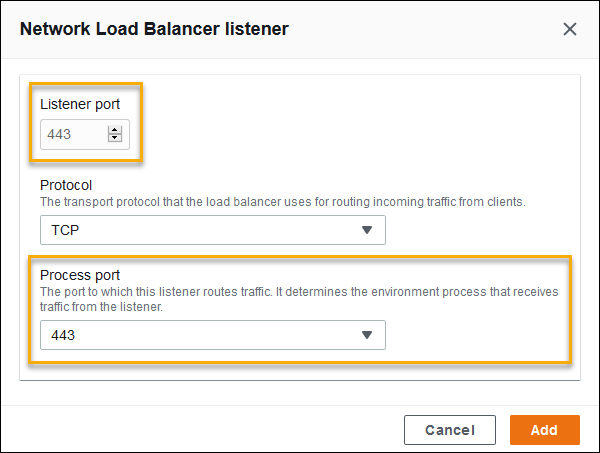 Use the Network Load Balancer listener dialog box to configure the port on which the listener listens to traffic, and to choose the process to which you want to route traffic (specified by the port that the process listens to). Use this list to specify processes for your load balancer. A process is a target for listeners to route traffic to. Each listener routes incoming client traffic on a specified port to a process on your instances. Initially, the list shows the default process, which listens to incoming traffic on port 80. You can edit the settings of an existing process, or add a new process. To start editing a process on the list or adding a process to it, use the same steps listed for the listener list. The Environment process dialog box opens. Use these settings to define the process: its Name and the Process port on which it listens to requests. Interval – The amount of time, in seconds, between health checks of an individual instance. Deregistration delay – The amount of time, in seconds, to wait for active requests to complete before deregistering an instance. The Elastic Load Balancing health check doesn't affect the health check behavior of an environment's Auto Scaling group. Instances that fail an Elastic Load Balancing health check will not automatically be replaced by Amazon EC2 Auto Scaling unless you manually configure Amazon EC2 Auto Scaling to do so. See Auto Scaling Health Check Setting for details. For more information about health checks and how they influence your environment's overall health, see Basic Health Reporting. In this example, your application requires end-to-end traffic encryption. To configure your environment's Network Load Balancer to meet these requirements, you configure the default process to listen to port 443, add a listener to port 443 that routes traffic to the default process, and disable the default listener. Configure the default process. Select the default process, and then, for Actions, choose Edit. For Process port, type 443. Add a port 443 listener. Add a new listener. For Listener port, type 443. For Process port, make sure that 443 is selected. You can now see your additional listener on the list. Disable the default port 80 listener. For the default listener, turn off the Enabled option. The EB CLI prompts you to choose a load balancer type when you run eb create. You can also specify a load balancer type with the --elb-type option. aws:elasticbeanstalk:environment – Choose the load balancer type for the environment. The value for a Network Load Balancer is network. aws:elbv2:loadbalancer – Configure access logs and other settings that apply to the Network Load Balancer as a whole. The ManagedSecurityGroup and SecurityGroups settings in this namespace don't apply to a Network Load Balancer. 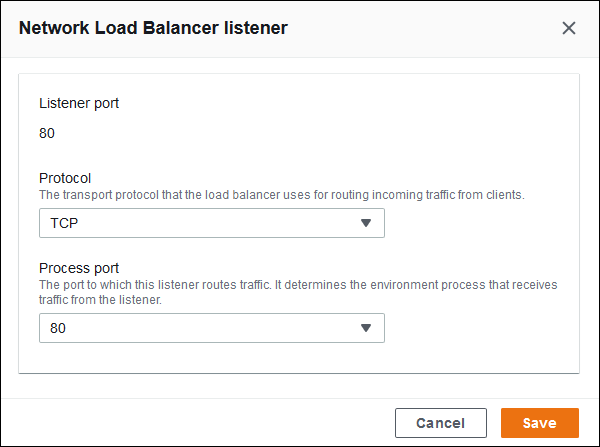 aws:elbv2:listener – Configure listeners on the Network Load Balancer. These settings map to the settings in aws:elb:listener for Classic Load Balancers. aws:elasticbeanstalk:environment:process – Configure health checks and specify the port and protocol for the processes that run on your environment's instances. The port and protocol settings map to the instance port and instance protocol settings in aws:elb:listener for a listener on a Classic Load Balancer. 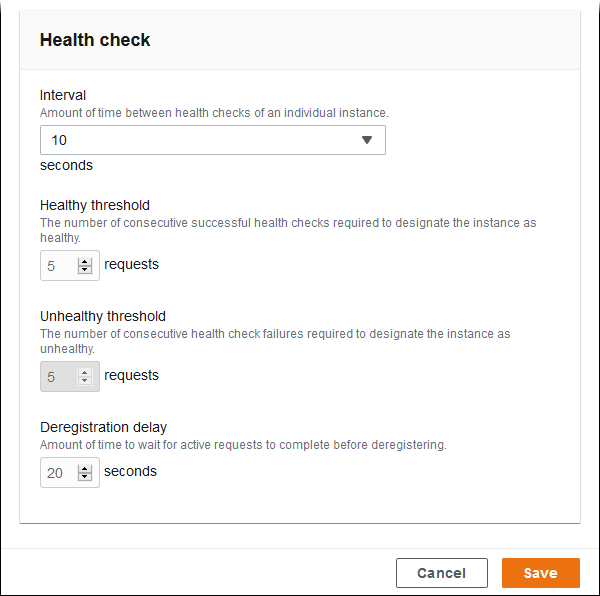 Health check settings map to the settings in the aws:elb:healthcheck and aws:elasticbeanstalk:application namespaces. To get started with a Network Load Balancer, use a configuration file to set the load balancer type to network. You can set the load balancer type only during environment creation. The following configuration file modifies health check settings on the default process. The following configuration file adds a listener for secure traffic on port 443 and a matching target process that listens to port 443. The DefaultProcess option is named this way because of Application Load Balancers, which can have non-default listeners on the same port for traffic to specific paths (see Application Load Balancer for details). For a Network Load Balancer the option specifies the only target process for this listener.